Since November 2007, the Centre has been preparing short outlook reports on various socio-economic development topics related to the OIC Member States. Using the Centre’s main database “BASEIND”, these reports present statistical information and analytical investigations on the topics under consideration, enriched with figures and tables. The topics of these reports include, among others, demography and structure of population, size and structure of the economy, saving and investment, structure and direction of trade, labour productivity, health, tourism, gender, food security, etc. The selected OIC Outlook Reports are also published in the Centre’s Economic Cooperation and Development Review as well as. 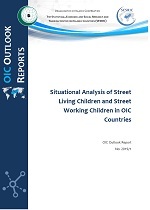 The OIC Member Countries, in comparison to developed countries, tend to experience higher number of street children with more severe conditions. The number and the condition of street children is diverse amongst the OIC countries due to the differences in economic, social and political contexts. Some of the OIC countries are better equipped to deal with street children while others are not as well prepared.